In relation to agriculture, what factors affect our ability to sustainably produce crops, and how do these factors change across the landscape? Where should agriculture expand, and where should it retract? 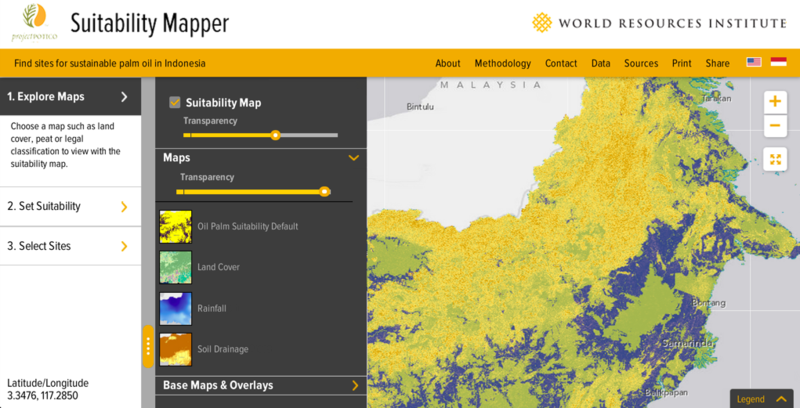 Blue Raster, along with partners World Resources Institute (WRI) and Sekala, has developed an interactive web application allowing users to customize criteria for sustainable agriculture and find sites for sustainable palm oil across Indonesia. Upon entering the Suitability Mapper, users visualize various layers superimposed on the Indonesian landscape including elevation, hill slope, rainfall, and soil acidity. 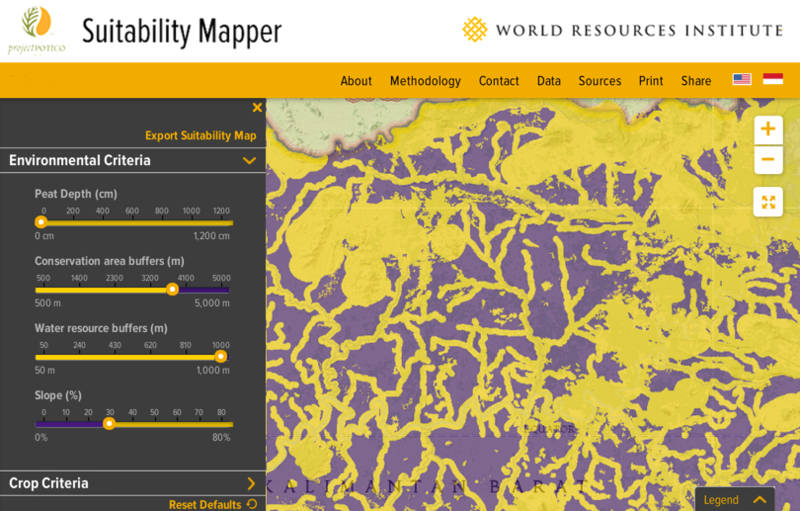 WRI provides a two-color layer showing the distribution of areas deemed “potentially suitable” (purple) and “unsuitable” (yellow) for sustainable palm oil production. Taking analysis a step further, the user can adjust the criteria for this suitability layer by adjusting controls linked to each palm oil variable. In the screenshot below, I have adjusted the suitability analysis to increase the mandatory distance from conservation areas and water resources. With my custom analysis complete, I can use drawing tools to summarize the results for a specific area. Results include the area’s legal status, amount of suitable area, distance from nearby roads, legal status, and whether an oil palm concession already exists in the location.